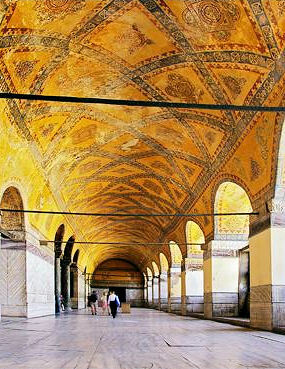 Explore St. Sophia (Hagai Sophia) which was built by the Emperor Justinian when Istanbul was Constantinople. This magnificent example of Byzantine architecture boasts a massive done, a lengthy nave, and an interior decorated with marble, precious stones, and pillars from Ephesus. You'll visit Topkapi Palace, a huge walled complex hugging the Bosporus. This is the former palace of the Ottoman sultans and now a museum with an extraordinary collection of Chinese porcelain, art, artifacts, and jewels, including the Topkapi Diamond. Tour the harem of Topkapi Palace which was carefully situated so that it could not be seen from the state apartments or the courtyards where public affairs were conducted. The home of the sultan and his primary living quarters is an exceptional insight into how the sultans lived. You'll see the Blue Mosque six graceful minarets adorn the elegant mosque, one of the city's most recognized landmarks. The superb interior is decorated with more than 20,000 blue Iznik tiles. Dine at the Topkapi Palace for a delightful lunch featuring Turkish specialties and beverages. You'll watch a carpet weaving demonstration in the Grand Bazaar and then have an opportunity to shop and have lunch. Be sure to bring your camera. Topkapi Palace is closed on Tuesdays and Saint Sophia is closed on Mondays. If your excursion date is on a Monday or Tuesday when these are closed your guide will provide you with a option which may include the Underground Cisterns. A tour voucher is required for children age 6 and older. No charge for children 5 and under.